Voting is a right and a privilege. People gave their lives for the chance at Democracy. Every summer, OCA-NY participates in a voter outreach campaign that includes door knocking, phone banking, and in-person voter registration. 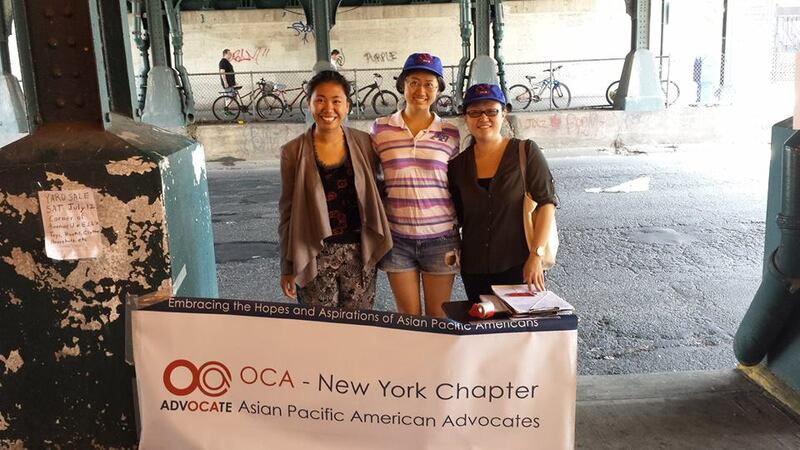 We are committed to informing the Asian Pacific American community of their right and privilege, and making sure that our voices are heard in the American political system. 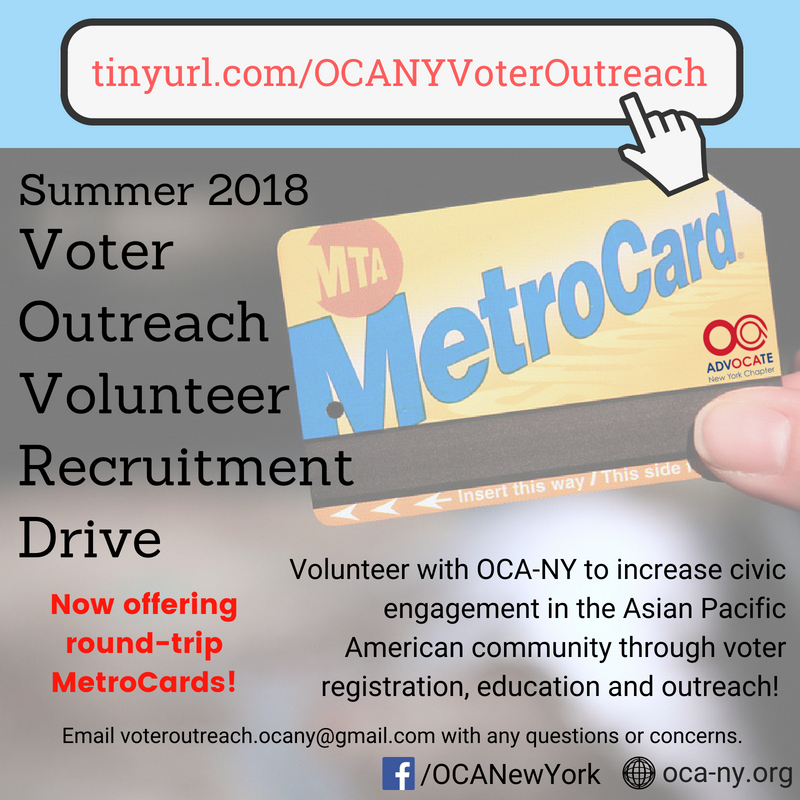 ​OCA-NY is excited to launch the second phase of our 2018 Voter Outreach Initiative to continue cultivating the civic and political voices of Asian Pacific Americans in New York City. 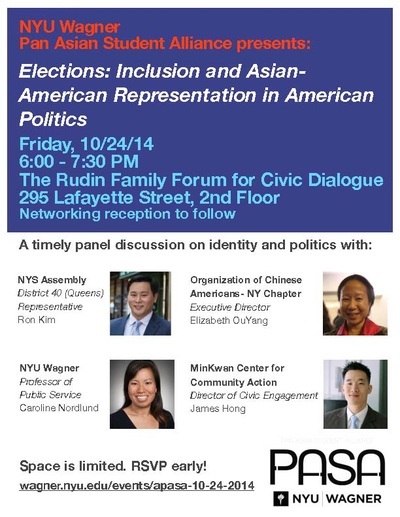 APA’s are a powerful force in shaping and influencing elections locally and nationally. We are the fastest growing racial population in New York City and our voices deserve to be heard. By mobilizing our friends, family, and community, we are raising awareness about issues affecting our communities and having a seat at the decision making table. 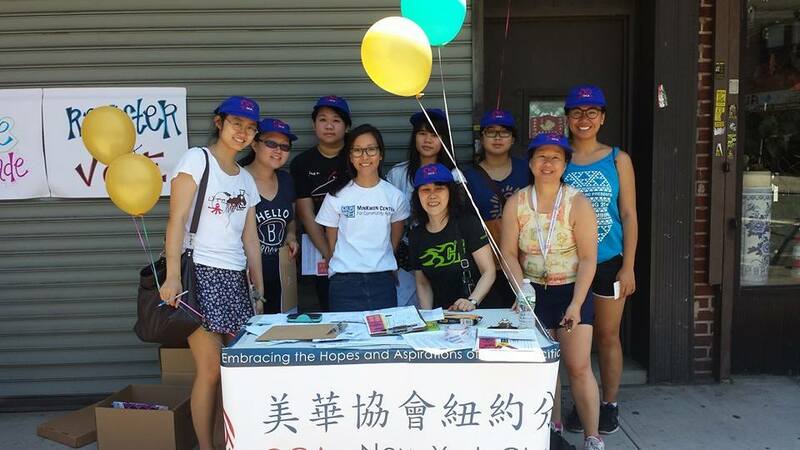 We are currently recruiting volunteers interested in promoting civic engagement in the APA community for this summer and fall! There are various ways to volunteer with us such as voter registration tabling, phone-banking, canvassing, to even sharing outreach materials on social media. We encourage you to sign up to do what you can! Please fill out the form below if you are interested in volunteering and we will be following up with you shortly. Opportunities are available at a rolling basis and will reflect your provided availability and interests! 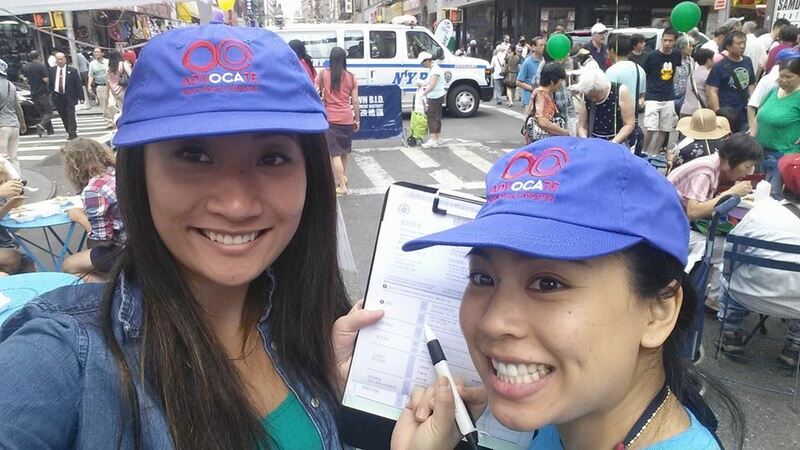 Email our Voter Outreach Coordinator, Samantha Ng, at voteroutreach.ocany@gmail.com. 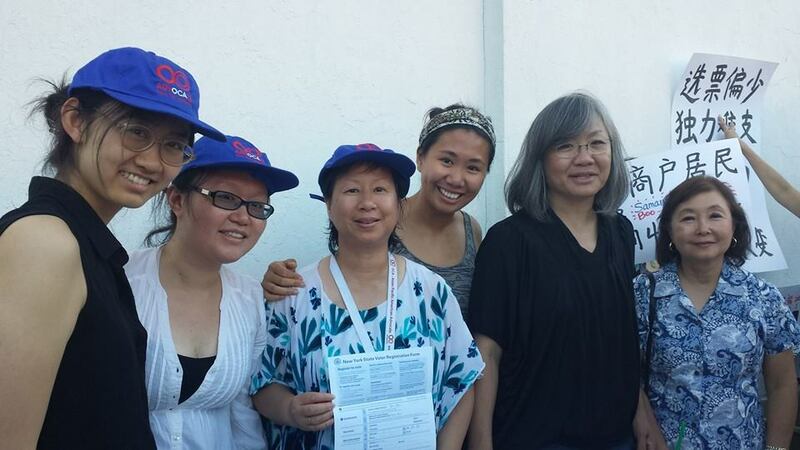 In 2016, we knocked on over 1,500 doors, made over 3,900 phone calls, recruited over 20 different volunteers and canvassers, and registered over 600 new voter registrations during a six-month period. 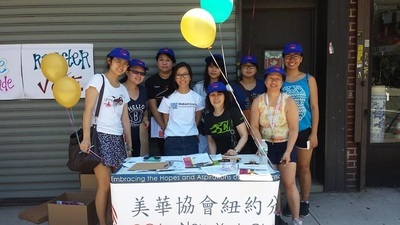 We went three times a week to conduct voter registrations at various locations such as Columbus Park, Manhattan Chinatown YMCA, Sara Roosevelt Park, Flushing Chinatown, Food Courts in Flushing, the Queens Public Library of Flushing, and Flushing Town Hall. 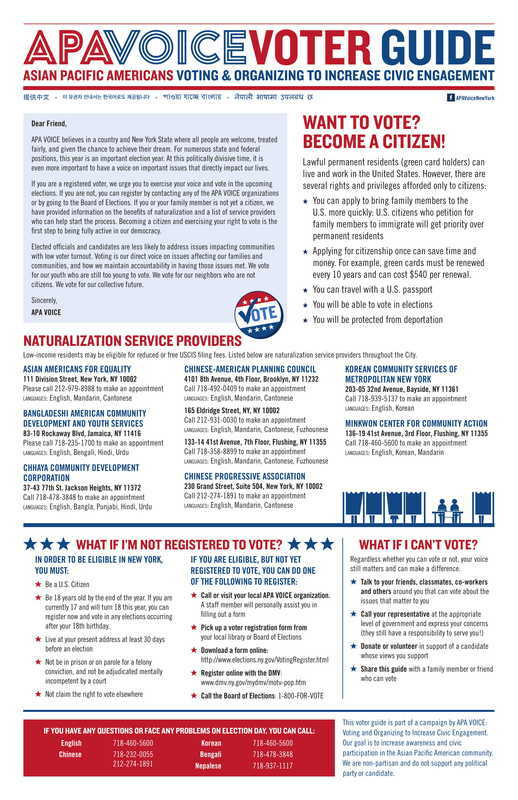 If you are a registered voter, you will be fulfilling one of the most important duties as an American citizen-exercising your right to vote today, November 4th. 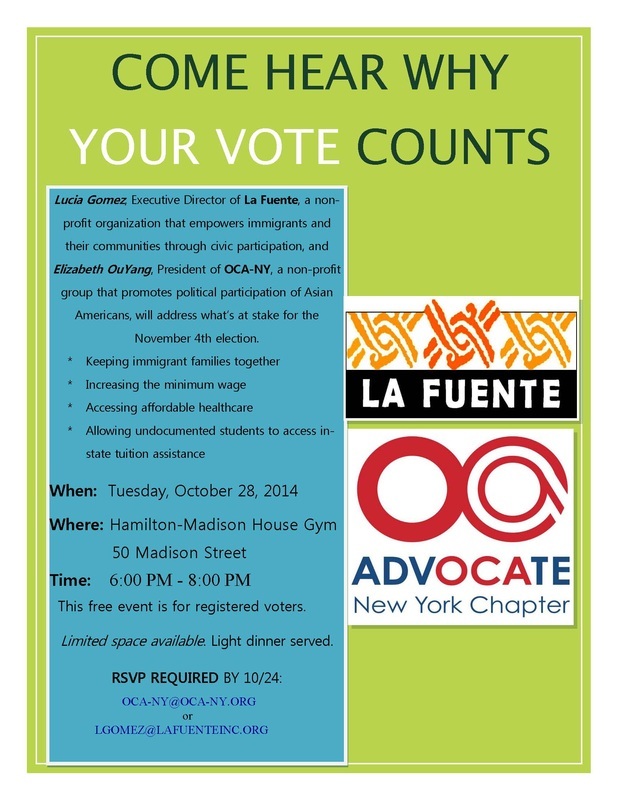 The outcome of this election will impact critical issues affecting you, your family, friends, and community. By voting, you have the power to voice your opinion on these issues. 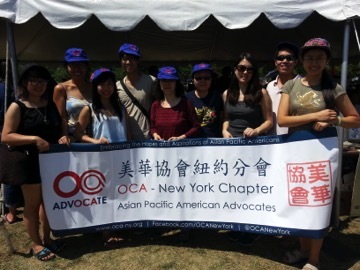 Founded in 1978, OCA Asian Pacific American Advocates-New York Chapter is a non-profit, non-partisan volunteer organization promoting the political, economic, and social rights of Asian Pacific Americans. 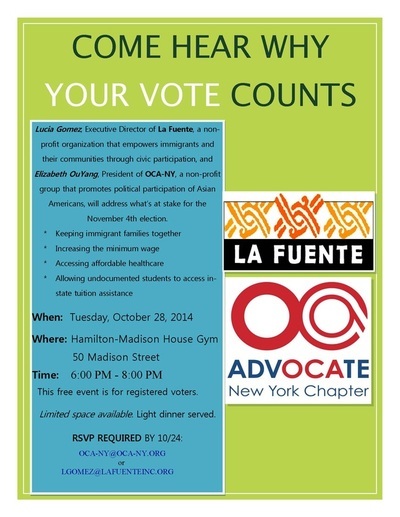 As part of the 2014 Immigrants Vote! 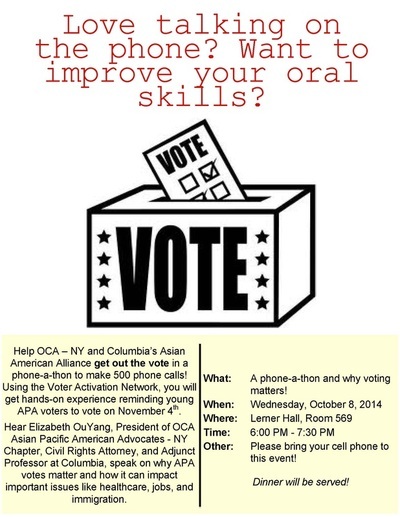 and the Asian American Pacific Islander Collaborative, OCA-NY is encouraging you to vote on Election Day. -future immigration to the U.S.
reunification of immigrant families and the number of Asian immigrants to the U.S.
whether undocumented students, educated in New York high schools, can apply for in-state tuition assistance. This would increase enrollment in our state colleges and universities, create jobs, and help the economy. -whether there is an increase in the state minimum hourly wage. An increase would help low and middle income workers offset the increased cost of living in New York City. -accountability of the state legislature in drawing district lines in a fair and neutral manner. District lines determine which district you vote in and who are in your district. The process is controlled by incumbents, however, OCA-NY does NOT believe that the redistricting commission described in Proposition 1 will make the process more fair since the state legislators will still have the ultimate say. It will make the current situation even worse if the proposition becomes part of the New York State Constitution. We are urging voters to VOTE NO on Proposition 1. 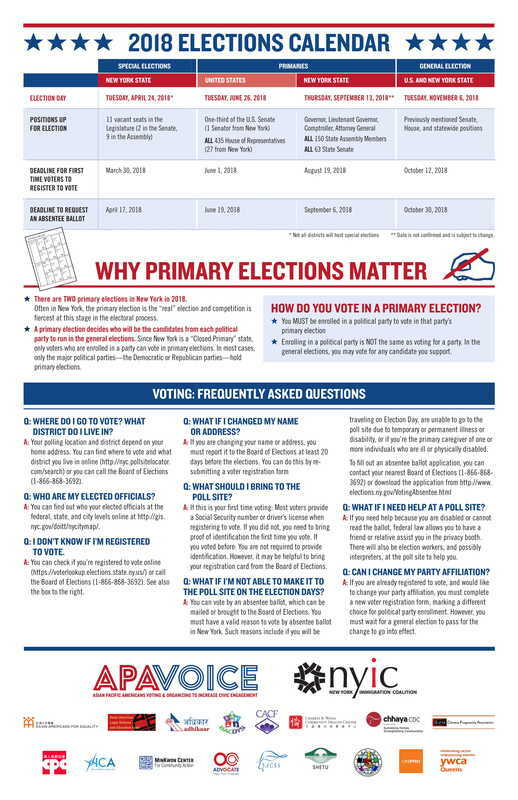 Please make an informed decision when you vote. Go to nyc.pollsitelocator.com to find out which candidates are running in your district and http://noprop1ny.com for more information on Proposition 1.